Michelle Callahan's WHITE FIRE & series giveaway! Imagine…a soldier stands before you. Tall, dark and handsome, he’s seen thousands of battles. He’s smoking hot, honorable, scarred, and has dangerous superpowers that you can barely comprehend. But this warrior is not from your neighborhood, or even your country. He’s from another time…and another planet. He followed the enemy through a wormhole to come to Earth over seven hundred years in his past to try to save humanity. And he needs your help. Here’s where it gets tricky. You think you’re a normal human? Well, you’re not. You’re what the Immortals call a Timewalker…you just don’t know it. And with the knowledge, and the awakening of your dormant DNA, comes power. Lots of power. Now what? Do you have what it takes to save the world and win the heart of this Immortal warrior? In WHITE FIRE, Emma Lawson is going to answer those questions the hard way. Keep your fingers crossed for her, because if she isn’t up to the task, Earth will fall, and life as we know it is over. Ajax, The Lost King of the Immortals, sacrificed everything but his memories. After the Time Crux, the loss of his beloved Queen, and a horrifying defeat at the hands of the Triscani horde in the war on Itara, Ajax’s loyal crew played a desperate gamble…to go back in time on Earth and try to change things. But they trusted the wrong man, and Ajax has spent the last seven hundred years locked in a prison with no key. The battle approaches at long last, yet he remains weak and tortured, a prisoner to his own dark power. He didn’t simply lose to the evil Triscani…he became one of them. The Triscani spent centuries searching for Emma Lawson’s soul. Their evil Hunters did everything they could to destroy her family’s bloodline before she was ever born. They know who she is, so they hunt her. They know the power she yields, and they fear her. They know The Lost King will do anything to save her, and they would use his love to destroy him. But Emma is human, not Immortal. She might be dangerously attracted to the newly freed Ajax, but her first priority is saving Earth from two warring Immortal races. Ajax believed himself in love with his Queen, but the woman he remembers no longer exists. This Timewalker will defy destiny, and she’s not going to play by anyone’s rules but her own. 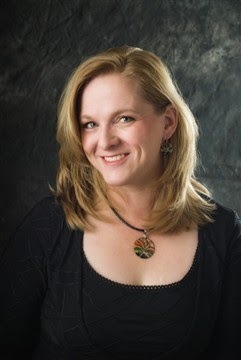 Michele Callahan is a car-pool mom who often makes emergency trips to the store for chocolate, coffee, or a Twix candy bar. She suffers from a dangerous case of sci-fi/fantasy fever and never turns down an opportunity to sit through a Star Wars, True Blood, Attack on Titan, or Matrix marathon. Her favorite things in books; hot heroes, superpowers, freakish things that can’t be explained by modern science, and true love! 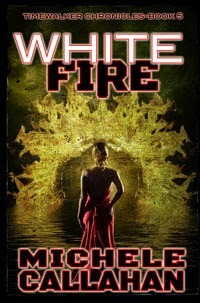 2 comments to Michelle Callahan’s WHITE FIRE & series giveaway! I’d love to believe. but I’d have to see it. This sounds like a great read. I’m adding to my wish list.